Technician In-a-Box, HVAC Services enables users to revolutionize their field service worker deployments and processes. 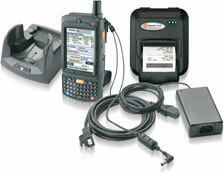 Targeted towards the HVAC industry, this mobile system utilizes the Motorola MC75 and Datamax O'Neil MF2te to wirelessly stream work orders and customer data out to employees in the field, allocate jobs to employees based on optimal routing and/or on-hand parts/materials, track usage of parts and materials needed for specific repairs, calculate customer cost on-site, and generate returns job completion and customer authorization info in real time. By reducing inefficiencies and common errors, users will realize a fast return on investment.